Restaurant Blauw is a modern eatery in Amsterdam. With Bright red interiors and beautiful architecture the place becomes a must visit for any traveller that comes this way. The place serves classical Indonesian dishes and scintillating drinks that are sure to tickle the royalty in you. The destination comes highly recommended by travellers and locals for its friendly staff. Take a bus from Amsterdam, CornelisKrusemanstraat. Take a tram from Amsterdam, Haarlemmermeerstation. How popular is Restaurant Blauw? People normally club together Bruges Waterways and EYE Film Institute Netherlands while planning their visit to Restaurant Blauw. People also prefer to end their day with Restaurant Blauw. We have tried both Meat and Fish Rijsttafels. Both of them were delicious. It's a nice experience to try. Stuff was really friendly and helpful. Great restaurant. Food is great and price is reasonable. I always go to blau every time i visit armsterdam. We visited this place for dinner. Took a couple of vodka tonics, nicely presented and good measures. Ordered the tasting menu. They adapted it to account for us not eating red meat, which was nice. Starters were very good, including curried mince chicken in pastry and fried fish. The main course was some 16 dishes. Impressively presented but we got the feel of quantity over quality. The prawns were chewy and it just felt everything was fried and sweet. Didn’t really hang together. There were 4 desserts which were all excellent, so a good finish. 3* rather than 4 as for the price the quality was not there in the main course. Service was good. Very nice. 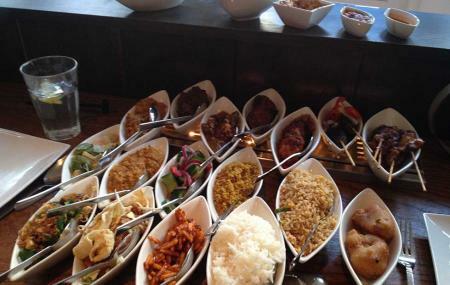 Immensely enjoyed the greate tasting Indonesian food. Great place to eat. Don't eat for 2 days, then order a rickstaffel(or whatever it's called) and you get about 15 small bowls of the tastiest Indonesian dishes. Gets busy so best to book a table.